Our seeds are taken into the field and cultivated by a skilled community of local growers. These growers work in conjunction with our talented field representatives. The technical personnel assist our growers with agronomic advice to help ensure the best quality crop possible. At harvest, we segregate the mature product by specific quality parameters ensuring variety integrity before it comes for cleaning at our facility. The meticulous testing of our samples in the germination lab ensures our seeds meet specific germination standards. This allows us to quickly verify our germination rates so that we can get our product to our customers faster. 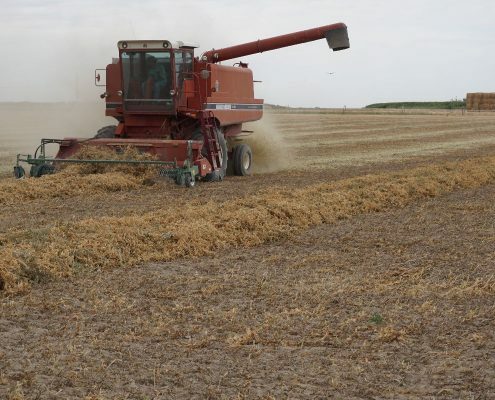 The milling process removes most of the dirt, pods, fodder, undersized seeds and rocks. The seeds are sent through a series of angled, vibrating screens with air blowing through the seeds. This removes the lighter materials. Next, a gravity table uses a combination of air, multiple angles, and vibration to segregate the lighter material from the heavy. Though centrifugal force, indent cylinders lift material from the seed allowing for a length-sizing separation of any remaining soil. 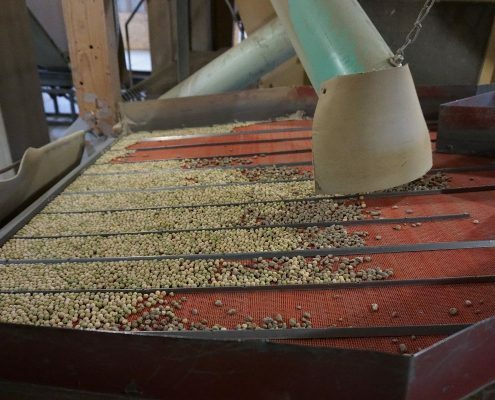 Our system consists of an eight-foot cylinder with small cups (known as indents) that rotates as beans are introduced at one end. The spinning of the cylinder causes any remaining soil to land in the indents. As the cylinder continues to rotate, the beans fall into one section and the dirt into another, further cleaning the seed. 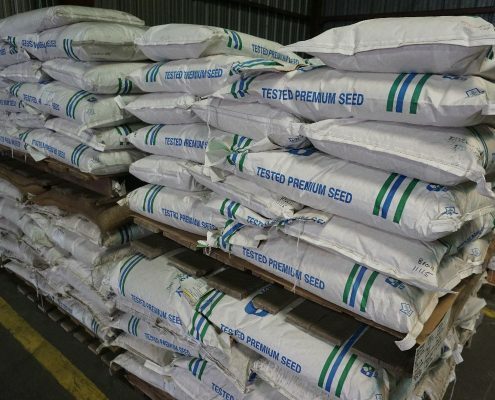 This process is only used for seeds to be shipped to customers who have a zero tolerance for soil in the seeds. Electronic eyes are a series of cameras, lights, and air jets that detect predefined defects in the seed. Each variety has a standardized “recipe” for the computer to follow. When the peas or beans drop down into trays in single file, they are analyzed individually. The lights and cameras signal the computer when defects are detected. The computer then sends a signal to the air jets to send a “puff” of air at the pea or bean with the defect sending it into the cull bin. Good product falls straight through the machine giving us our final cleaned product.